I have designed, delivered and managed a number of successful training programmes. This involved training staff from new recruits to line management level as well as introducing regular refresher training and skills auditing in order to monitor and maintain standards. 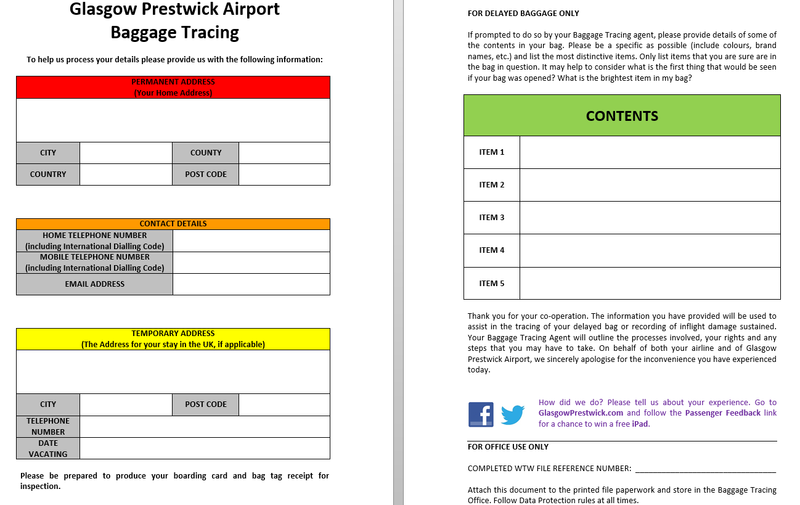 My largest training programme to date was for Glasgow Prestwick Airport where I introduced a new Baggage Tracing system and wrote all of the associated manuals, handouts and presentations. Prior to the introduction of my training package, there was no standard training for Baggage Tracing, service delivery was not uniform and the successful tracing rate was unacceptably low. My training communicated the procedures to be implemented and set out the expected service levels for all staff. Scroll down to find out more and to view samples of the material I produced. I wrote a series of five comprehensive training manuals that took trainees from beginner to advanced level and later served as important reference documents. Each manual combined technical aspects (how to use the system, create files etc.) alongside advice on how to speak to passengers, customer service skills, troubleshooting, departmental procedures and service level requirements. The second manual in the series, Damaged Bags, is embedded below. The next stage of the programme involved maintaining staff competency. I designed and delivered a classroom-based refresher training package that featured a PowerPoint presentation covering new procedures, troubleshooting, common mistakes and Q&A sessions. To accompany this training I produced a series of handouts (embedded below). Each one simplifies a difficult area of the syllabus to a single handout. A written test covering knowledge of Baggage Tracing procedures. A practical assessment requiring staff to create a series of system files and demonstrate the required skills. The procedures test was updated annually to reflect areas of concern, new policies and to ensure that staff did not simply memorise the test. As part of a larger company-wide project, I wrote detailed procedural documents that outlined the duties required of Baggage Tracing Agents and the standard procedures that were to be followed. Procedures were written in a considerably more formal style than my other material and presented in a uniform format, in line with the wider project. Each procedure became a chapter in a larger formal policy document governing the company’s operational departments. In addition to standard procedures, I also produced a series of internal forms and documents as part of the wider push to improve the professionalism of the service and standardise customer service interactions. Internal Forms Sample: A form for collecting passengers’ details. This form was a more polished and professional means of data collection. It ensured that agents were able to collect all of the basic information required in a single interaction, therefore reducing file creation times. It also allowed for file auditing – the details entered into the system file could be compared with those provided by the passenger on this form. Contact me to discuss your training or technical writing needs.